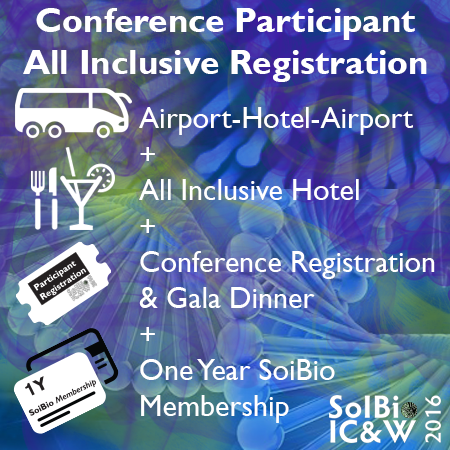 PLUS a 1 year of SoIBio membership (if the participant is not currently member). Please let us know your preferred type of bed. Please be advised that the type of bed in your room depends exclusively to the hotel availability at the moment of your arrival. Please let us know the name of the institution you are coming from. (Optional). Please let us know the Department within your Institution/Affiliation. No. I'm not sharing room. My room is a single occupation room.Yes. I'm sharing room with an Accompanying Person.Yes. I'm sharing room with another paid Conference Participant that I know.Yes. To save some money I accept to share room with another paid Conference Participant (assigned by the organization). Please let us know if your are sharing room with a paid Conference Participant, or with an Accompanying Person (not assisting to the conferences). Name of the Accompanying Person. Please let us know the name of the Conference Participant you are sharing room with. If you don't know another Conference Participant but you are willing to share room to save some money, please answer "No" to the previous question. Please select your date of departure. PLUS 1 year of SoIBio membership (if the participant is not currently member).